Our signature event of the year, the Taste features around 30 restaurants from in and around Valparaiso, Indiana. Each restaurant brings samples of some of their best eats to share with roughly 1000 participants who fill the Porter County Expo Center hoping to go home stuffed. The evening is enhanced with a Raffle, and Silent Auction. 100% of profits are redistributed into the community. 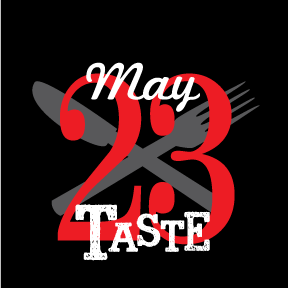 Corporate sponsors are welcome and Taste organizers are already looking for interested sponsors and restaurants to make the 29th Annual Taste on May 23, 2019 the best yet. Email rfrataccia@frontier.com for more information. The 29th Annual Taste of Valparaiso will be held at the Porter County Expo Center from 5:30-8:30 pm on May 23, 2019. Tickets are available now. Early Bird tickets are $35 from a Tri Kappa member, and locally at Designer Desserts, Radius, and Tudor Carpet One. Tickets are $45 at the door, so remember to buy early and save. Cash, credit, and personal checks are welcome at the door. Due to space limitations and large crowds, strollers are not allowed in the Taste. Children old enough to walk need a full price ticket. Each year, Northwest Indiana’s tastiest eateries line the walls of the Porter County Expo Center to show off their signature dishes and other tasty concoctions. A full cash banquet bar is available to compliment the food. See below for our list of restaurants for 2019. Continue to check back, as we are still recruiting restaurants. The 2019 Taste is sponsored by our friends at Urschel Laboratories, Sage Popovich, AM Stabilizers, Elite Crete, Horizon Bank, Fairway Laser Systems, Berkshire Hathaway – Debbie Miller Team, Thorgren Industries, Cliff Bryan, 1st Source, and Konovsky Farms. If you would like to sponsor the next Taste, please contact us at rfrataccia@frontier.com. Thanks also to Tudor Carpet One, Radius, Designer Desserts and Economy Signs for their support! As always, we have scoured the community for delightful packages you won’t want to live without. Come prepared to bid on goods and services donated by local businesses and Friends of Tri Kappa. As part of our mission to support Arts in our community, the evening’s entertainment will feature Mayor Jon Costas in the Expo Center and the VHS Orchestra as guests arrive. Thanks again to everyone who comes out to support us at the Taste of Valpo!